SAALT’s strategies include advocating for just and equitable public policies at the national and local level; strengthening grassroots South Asian organizations as catalysts for community change; and informing and influencing the national dialogue on trends impacting our communities. SAALT’s work reaches a range of constituencies, including the organizations that are part of the National Coalition of South Asian Organizations (NCSO); other social justice organizations; South Asians who are marginalized and disempowered; South Asian activists, students, and professionals; and those seeking to become more engaged with social change efforts in their communities. SAALT is the community’s voice in our nation’s Capitol. 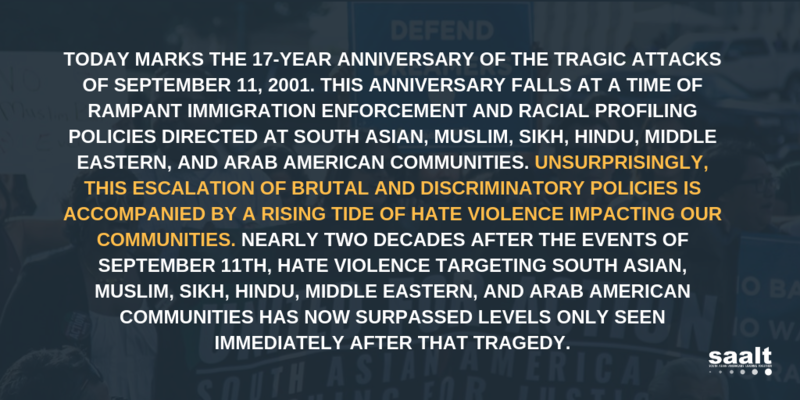 SAALT connects with elected officials, media, and government agencies to highlight issues that affect South Asian Americans. Our work includes regular briefings and meetings with the White House, Department of Justice, and Department of Homeland Security, as well as our Advocacy Days that bring advocates and community members closer to decision makers in D.C.
SAALT brings organizations together across program areas and geographies. The NCSO is a network of 62 community-based organizations that have similar values and principles, and that provide services to, works with, convene, organize, and advocate for South Asians in the United States. SAALT coordinates the NCSO’s activities, which range from skills-building to a biennial Summit and collective statements. SAALT is a resource for information on issues affecting the South Asian American community: Our reports shine a light on many of the issues affecting the South Asian American community. Recent reports include Communities on Fire; Power, Pain, Potential; Under Suspicion, Under Attack; From Macacas to Turban Toppers; and Building Community Strength. SAALT creates opportunities and forums for dialogues and coalitions within and outside the South Asian American community. SAALT has convened events in Washington DC, Atlanta, North Carolina, Detroit, Philadelphia, Chicago, Houston, Miami, New York, New Jersey, and the San Francisco/Bay Area ranging from community dialogues to town hall discussions. SAALT develops South Asian community leadership: Through our Young Leaders Institute Program (YLI) SAALT has trained over 70 young South Asian Leaders in community-based projects. SAALT’s biennial National South Asian Summit, celebrating its 10-year anniversary in 2017, brings advocates and organizational leaders together in Washington, DC for skills-building workshops, community-led training and briefings. SAALT maintains an office in the Washington, DC area and in New York City with committed staff, volunteers, and interns: SAALT serves the South Asian American community from our nation’s capital, which allows us to engage with policymakers and elected officials on important issues affecting the South Asian community. Click here to download SAALT’s brochure.